Don't go shopping for a hot tub before reading our spa buying guide. We explain the types of spas available and which brands are the best choices. There are also tips on the features you can find in different hot tubs and how to care for your purchase properly to extend its life. 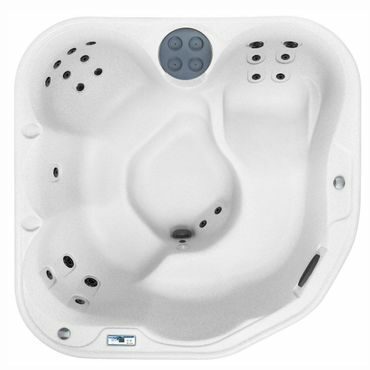 The Lifesmart Antigua, also known as the LS-400-DX, is a full-featured above-ground spa with seating for five; 17 therapy jets; a waterfall jet and more. The faux-mahogany skirt adds a touch of class, while the locking hard cover adds a touch of convenience and safety. The Antigua is made by the parent company of Hot Springs hot tubs, a well-respected brand sold at specialty retailers, and it meets California energy efficiency standards. Those on a tight budget don't have to do without the benefits of a full-featured above-ground hot tub, not with options like the Lifesmart Bermuda (also known as the 100-DX). The Bermuda features Lifesmart's rugged RockSolid shell, 12 therapy jets, a waterfall jet and a locking cover. Capacity is rated for four people, but that might be pushing things. It's very energy efficient and meets standards in all states, including California. 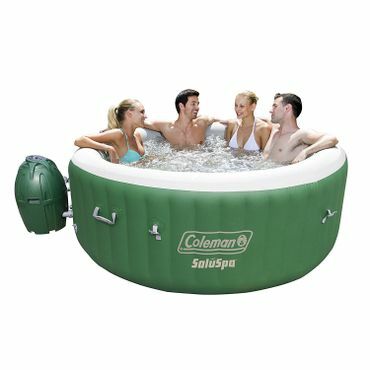 One of the least-expensive inflatable hot tubs you can buy, the Coleman Lay-Z-Spa is quick and easy to set up. The Coleman comes with a padded ground cloth, inflatable insulating cover, floater for chemicals and a repair/patch kit should the tub spring a leak. It's rated to hold six people, but things will get very tight with that many. It's also not recommended for use if the air temperature is below 40 degrees. Just hearing the words 'hot tub' can conjure up visions of sheer luxury or good times with close friends. But hot tubs can offer benefits beyond just fun and relaxation. Many people find a nice soak in a bubbling hot tub can help to relieve the stresses of the day. Others find relief from lower back pain or after exercising. There are a few scientific-based studies that back up these anecdotal experiences, although, according to the National Institutes of Health (NIH), "There is lack of evidences for the mechanism on how hydrotherapy improves these diseases, which is one of the limitations of hydrotherapy, and further studies are required to find the mechanism of hydrotherapy on various diseases." Still, if it makes you feel good, and there is no reason to avoid hot water -- such as pregnancy or heart disease -- a hot tub can be a very enjoyable way to relax and socialize. Owning a hot tub has its drawbacks, however, and the most obvious one is cost. Prices range from less than $350 for an inflatable model to upward of $20,000 for a top-of-the-line in-ground spa. Yet the costs of ownership don't end with purchase. Owners must also pay for water, the energy to heat the water, and chemicals to keep the tub clean. Maintenance is another factor: You can't just climb in when you feel like a good soak and ignore your spa the rest of the time, or you'll put yourself at risk for painful or itchy skin reactions. Keeping a hot tub in good condition requires covering it between uses, testing the water frequently and adjusting its chemical content, cleaning the tub and filters, and draining and refilling it every few months. Still, many owners say the delights of soaking in a warm, bubbling tub are worth the hassle. The first hot tubs -- simply large wooden wine casks filled with hot water -- became popular in California in the 1960s. In 1968, Roy Jacuzzi introduced the Jacuzzi tub, which incorporated jets of hot water to provide a soothing massage. Other manufacturers soon followed suit, designing more sophisticated tubs made of molded fiberglass or plastic. They called their creations 'spas' to distinguish them from the old-fashioned wooden hot tub. Today, most retailers and consumers use the terms "hot tub" and "spa" interchangeably. The term "Jacuzzi" is occasionally treated as a general-purpose name for hot tubs, but it's actually a trademarked brand name. The shell or tub surface. It may be made from wood, molded acrylic, fiberglass, thermal plastic, poured concrete or air-blown concrete, which is known as gunite. Inflatable spas are generally made from vinyl. The skirt or cabinet. This is the outer box that encloses an above-ground tub. It may be made from wood or synthetic materials. Insulation. This fills all or part of the space between the shell and the cabinet. The better the insulation, the less energy the tub will use. Seating. Wooden tubs may feature simple bench-style seats, while newer molded tubs offer a variety of contoured seats. Seats may be upright or reclining, and may provide extra head, neck or arm support. Jets. The number and placement of water jets varies widely. Inflatable spas often use air blowers rather than water jets to bubble the water. Heater. Most spa heaters run on electricity, but some are fueled by natural gas or wood. Pump. The pump keeps the water circulating through the jets and filters. Some tubs have two-speed pumps, with the higher speed for jet action and the lower speed for circulation. Others combine a one-speed pump with a smaller circulation pump. Filter. There are several types of hot tub filters. Cartridge filters are the most common, but larger tubs may use filters of sand or diatomaceous earth. Those filters are more efficient but much harder to clean. Controls. A simple control panel allows users to adjust the water temperature, and turn jets on and off. Fancier hot tubs may include controls for adjusting the pressure of individual jets, activating lights and even playing music. There are four basic types of hot tubs. The most popular is the above-ground, prefabricated hot tub that's typically made from molded acrylic backed by fiberglass or ABS plastic -- these are often referred to as "plug and play." A cabinet of wood or a durable synthetic lookalike surrounds the tub. Some newer models are made entirely from rotationally molded plastic called rotomold, or "roto" for short. This material is tough, lightweight, inexpensive, and comes in a variety of colors. It's generally used only for smaller tubs that hold a maximum of six people. Still less common are above-ground tubs made of stainless steel, which is attractive and durable, but very expensive. 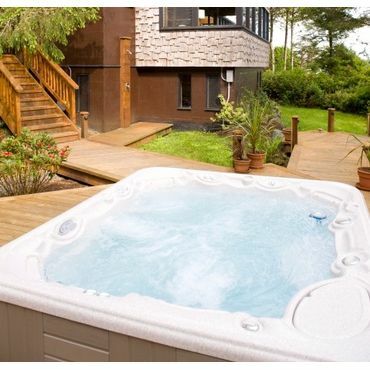 Prices for an above-ground tub can start at $2,000 for a basic rotomold spa and go up to $17,000-plus for a high-end acrylic hot tub with a genuine wood cabinet and lots of features. In addition, above-ground spas must be installed on a level, stable surface like a concrete pad, and some models require a 220-volt outlet. If you already have the necessary electrical outlets, plumbing, and a suitable site, installation costs can be fairly minimal, otherwise all but the handiest of DIYers will need to budget for the services of a qualified electrician, plumber, and mason or contractor. Above-ground hot tubs are often labeled as portable, and technically they are. A small roto spa can be set up on the deck during the summer and stored in the basement in the winter. That said, at 225 pounds and up, these tubs are still fairly difficult to move. A more truly portable option is a soft-sided, inflatable hot tub. Generally made of vinyl, these tubs arrive deflated and can easily be installed on any level surface, indoors or out. Just inflate the tub with the accompanying motor and fill from a hose, then plug in the heater. Vinyl tubs are not only easy to take with you when you move but can also be transported to a party or on a camping trip. They're also by far the least expensive type of hot tub; several models are available online for less than $350. But there are some downsides with inflatable hot tubs. The vinyl material is easily damaged, and inflatable spas usually rely on blowers rather than the hot water jets found in more upscale choices. The aesthetics of an inflatable hot tub -- think oversized blow-up kiddie pool -- have drawn some scorn as well. Wooden hot tubs are the third choice among above-ground spas. These models hearken back to the hot tub's origins as a wooden wine cask. Typically built using redwood, cedar or teak, these spas often have a simple round design with bench seating. Because they're shipped in pieces and assembled on site, they can be carried through doorways and up or down stairs to their final location; bulky acrylic tubs may not fit through narrow spaces. The appeal of wooden tubs lies mainly in their durable construction and attractive appearance. Although they lack the contoured seating found in other spa types, they tend to be deeper, increasing the amount of legroom and the effects of buoyancy. Because they hold a greater volume of water, however, they're very heavy and must sit on a base of solid concrete or a specially engineered and reinforced deck. 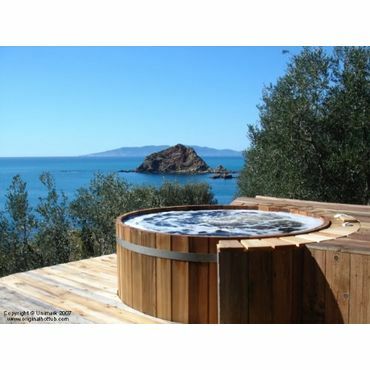 Unlike most other hot tubs, wooden tubs may be heated with gas or wood as well as electricity. They generally range in price from $4,000 to $9,500 for a complete system. In-ground hot tubs are the most expensive because professional installation requires excavation as well as plumbing and electrical work. Total costs range between $15,000 and $20,000. They're typically made of gunite or poured concrete, and sometimes have a decorative tile overlay. They may not have as many jets or be as energy-efficient as above-ground tubs, but you can opt for a gas heater to save on long-term energy costs. Because in-ground spas are permanent, they can potentially raise the value of your home. The downside, of course, is you can't take it with you if you move. What sets a hot tub apart from a simple bathtub is its water jets. First used on the original Jacuzzi tubs in 1968, the standard water jet pushes water in a straight line so it hits a single spot at a steady speed. Modern tubs offer a variety of options. Swirl jets move water in a circular pattern and moving massage jets oscillate the water along a line. Shoulder jets installed above the water line direct a stream against the shoulders, and they may be paired with pillow jets that massage the neck. Mini jets can be clustered to create a multi-action massage against a specific area. When choosing a hot tub, don't assume that more jets are always better. Experts say it's far more important for the jets to be placed where you'll find them most comfortable, and that varies from person to person. Some people like a powerful massage while others prefer a gentle swirl of water around tired muscles. The best way to find the right setup, is to do a "wet test" of any hot tub before you buy. Many spa retailers will allow you to test the spas in their showroom; however, if you're buying online or from a department store or big-box home improvement store (like Home Depot) you'll just have to take your chances unless you're already familiar with the model you're interested in. If you are buying from a specialty retailer, you may be able to customize the location of jets in a higher-end tub to meet your particular needs, but even jets in a standardized placement might be adjustable. This would allow you to switch individual jets on or off or adjust their flow to create your ideal massage experience. Note that inflatable hot tubs and even some very cheap above-ground models might lack water jets altogether. As noted in the above discussion of hot tub types, these use air blowers to agitate the water in the tub. User reviews of such hot tubs say that these blowers often do a good job of replicating the swirl of water in a standard hot tub, though not the massaging action or other benefits of water jets. The other downside is that we've seen reports that the bubbling action can cool the water down fairly fast -- limiting usage to a half hour or less according to some reports. Some also gripe that the blowers can be noisy. Seating is another factor to consider. Obviously, the number of people a tub can accommodate will depend on its size: The smallest tubs hold just two people while the largest can fit a party of 10. Seat position and shape are important, as well. For example, the size of the footwell -- the space for feet below the seats -- will affect how crowded the tub feels when full of people. Simple bench seats, often found in traditional wooden hot tubs, are easy to move around on and accommodate larger groups. Molded seats offer more support but may not fit all bodies. Special lounger seats allow you to sprawl full length, but they take up a lot of space. Again, if you can, test the tub in person to make sure the seats are comfortable for you. Besides the basic arrangement of seats and jets, hot tubs now offer a wide variety of amenities. Some models come with both interior and exterior lighting, multiple pumps and molded headrests. High-end tubs might include built-in sound systems and even TV sets, all controlled from a panel on the tub itself. There are even hot tubs with waterfalls and built-in workout equipment. And, while it might seem mundane by comparison, don't forget about steps to make getting into and out of the hot tub easier and possibly safer. Some hot tubs include those, with others it's an extra-cost option. A hot tub cover keeps debris out between uses, but its most important benefit is to significantly improve energy efficiency. The cover may come with the tub or be sold separately. Not all hot tub covers are weather resistant, but aftermarket PVC soft covers can be used to protect the insulated cover from the rain and sun. Read on to learn about hot tubs and energy use for more about insulated hot tub covers. Hot tubs have become much more energy efficient in recent years, thanks largely to California Energy Commission requirements that took effect in 2009. Yet even with these standards, a hot tub can cost $2 to $3 per day to operate. If you use your spa a lot, it may be more energy efficient to keep it running close to the temperature you want to keep it at -- that also makes it more convenient to use on impulse because you don't have to wait long for it to heat up. Insulation is the most important factor in preventing heat loss. There are three main types of insulation for hot tubs. Basic insulation is a thin layer of polyurethane foam applied to the underside of the hot tub shell. Most of the space under the tub is empty air, which makes it easier to access the plumbing. Basic insulation is inexpensive but won't do much to control heating costs, especially in standby mode. Layered or blanket insulation combines basic insulation with an additional layer of foam on the inside of the cabinet. The best blanket insulation has multiple layers of high R-value material on all four walls. If the spa has removable walls, the insulation can be moved aside for maintenance. Full-foam insulation is a thick layer of solid foam that completely fills the space under the tub. More than 70 percent of above-ground hot tubs on the market use this type of insulation. In addition to slowing heat loss, it provides soundproofing benefits, and helps support the plumbing and the tub itself. Look for closed-cell foam, which will insulate better because it can't absorb water. Of course, insulating the sides of the tub can help only so much if the water itself is exposed to air, which makes an insulated cover essential. A typical cover has a core of polystyrene foam wrapped in polyethylene plastic. The foam varies in density from 1 to 2 pounds per cubic foot. A cover of high-density foam will weigh more, but will also be stronger and insulate better. Ideally, the plastic outer coat should be thick and well-sealed so moisture can't penetrate the foam. Most covers fold in half for storage with a gap between the two halves, but a sealing gasket can improve the insulating power by as much as 5 percent. The best covers also have a generous 'skirt' that completely covers the edges of the spa. If your hot tub is outdoors, the cover should have tie-downs made of nylon webbing sewn into it at several spots to keep it in place. A locking cover is crucial if you have children or live in an area where neighborhood children might be able to wander into your spa's vicinity. The most secure locking covers can only be opened with a key that you can keep in a secure location. Other features of a hot tub can help keep the heat in. For instance, the pump generates a significant amount of heat during use, so some models recycle this heat into the tub. That can be used to either heat the tub's pipes or produce a stream of warm air directed into the water. Hot tubs with an economy mode automatically lower the water temperature when the tub isn't in use without shutting off the heater completely. While a hot tub's heater is the biggest energy hog, other parts use power, as well. You can also save energy by avoiding oversized pumps, which don't actually improve performance. Instead, opt for either one high-powered pump or multiple pumps that use less power. Other energy-saving features include LED (rather than incandescent) lighting and an automatic shutoff, which can extend the life of your hot tub. Not many expert sources compare brands of hot tubs, and still fewer evaluate specific models. The one credible review of hot tub brands comes from Spasearch, which publishes an annual list of Trade Certified Manufacturers, awards that are based on customer satisfaction surveys and ethical business practices. While they don't give any additional information or recommend any specific spas from those manufacturers, the information provided can still be a helpful in choosing a reputable spa maker. The one question we can't address about these types of hot tubs is how good a value they are, or even how much they cost. All -- as is the case with most hot-tub brands mentioned by expert reviews -- are sold exclusively through specialty retailers who are prohibited from disclosing their pricing online. You have to contact those dealers directly to discuss pricing, options, installation, etc. All of these manufacturers have dealer locators and often offer online quote forms at their site. That said, we did find a number of hot tubs available from retailers such as Home Depot, Amazon, Lowe's, Wayfair and elsewhere. These spas are ignored by most hot tub experts, and some recommend against them, but many receive enough positive user feedback to indicate that they are very good performers, especially in light of their price relative to models sold through specialty retailers. Chief among those are hot tubs sold under the Lifesmart brand. Lifesmart spas aren't named at Spasearch. However, Lifesmart spas are made by Watkins Manufacturing, which is also the maker of Hot Springs hot tubs -- a brand that's very well regarded -- and users generally rate Lifesmart hot tubs highly at retail sites. For example, we saw good feedback for the Lifesmart Antigua (Est. $3,000) hot tub, also known as the LS-400-DX. It features 110-volt plug in and start operation, with 17 "therapy" water jets plus a waterfall jet. It meets the California energy standards, so it's highly efficient. Features and extras are limited, but a 2-inch thick locking hard cover is included. No one will mistake the mahogany toned plastic skirt for real wood, but it doesn't draw too many complaints for being unattractive. The company's RockSolid shell is claimed to be tougher than shells of competing hot tubs, and user feedback doesn't indicate any disturbing patterns regarding durability -- though the odd complaint or two isn't unheard of. When reviewing owner feedback, we find that this five-person spa is well liked. Some express trepidation over making this type of purchase without seeing the hot tub first, but most say they are more than pleased over how things turned out. Some reviews are posted after a year or more of ownership. If your budget is smaller, the Lifesmart Bermuda (Est. $2,000), also known as the LS-100-DX, looks like a good choice. This is a compact four-person tub with sandstone-colored RockSolid shell and surround. It can hold up to four people and features 12 water jets, a waterfall jet, and a spa light with changeable red and blue lens caps for whichever color suits your mood or décor. It comes with a locking cover and meets California energy standards. Like the Lifesmart Antigua, the Lifesmart Bermuda draws very good feedback. Overall, owners say that the Lifesmart Bermuda works well and is easy to set up and use. Some report performance is still going strong after a year or more. There are some negatives noted even among fans, however. One is that while the Bermuda is rated to hold up to four people, things can get a little tight with that many. The spa can also struggle to maintain heat in very cold conditions. Most say that these are minor tradeoffs in exchange for the value, energy savings and general performance they receive. Some consider most above-ground hot tubs, such as the models listed above, to be portable, but they are large, heavy units that most won't want to move around very often once they are set up -- and you'd have to drain them to do so. Inflatable hot tubs are truly portable, and are relatively inexpensive, however they have some significant downsides -- most of which seem to bother hot tub aficionados and experts more than they bother owners, or at least those owners who understood what they were getting. A case in point is the Coleman SaluSpa (Est. $330). It has all of the downsides of most inflatable hot tubs as outlined in our discussion of Types of Hot Tubs, including the use of air blowers instead of water jets, less durable construction, and an aesthetic that screams kiddie pool more than it does spa. Most owners, however, don't seem to care. 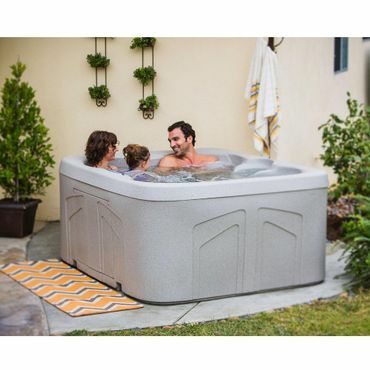 They love the Lay-Z-Spa's relative value as it's one of the least expensive hot tubs you can buy. Owners also like the easy set up and low maintenance. Some note that it takes some time for the water to warm up completely. Once warm, the Coleman does a surprisingly good job of maintaining its temperature, most say, though things cool off when the air blower is going. Keep in mind that this hot tub is not designed for use at air temperatures below 40 degrees -- something that disappoints some users. Several say that they are surprised at how effective the air bubbles are at providing a satisfying water massage. There are no interior seats, and while Coleman hot tub is rated to hold up to six people, reviewers say that two to four is more realistic. Among the included accessories are an inflatable hot tub cover, a padded ground cloth and a floater to hold pool chemicals for water sanitation. The Lay-Z-Spa is covered by a one-year warranty. Accessibility. Your hot tub must fit into the space you choose and be able to pass through any gates, doors or hallways along the way. This isn't a problem with an inflatable spa or a kit-built wood hot tub, but if you buy a rigid tub, take careful measurements to make sure it fits. Once it's in place, you'll need enough room around the hot tub for entering and exiting safely, and performing any cleaning, routine maintenance or repairs. If your spa is outdoors, you'll want to install it in a place where debris from trees, bushes and other sources isn't likely to fall into the water. A strong, level surface. A hot tub filled with water is very heavy, and it must sit on a foundation strong enough to support its weight. Experts say the best support is a pad of reinforced concrete, but you can also use a base of patio blocks or a ready-made plastic spa pad. No matter what you use, it's important to make sure the surface is level. If you want your hot tub on a deck, consult a contractor to ensure your deck is structurally strong enough to handle the weight. You may need to add reinforcement. Electrical requirements. Your hot tub must be within reach of an outlet. If you need to use an extension cord, make sure it's rated to handle the current draw of your spa's pump and heater with room to spare. A standard outlet will work if your tub uses 110-volt power, but a 220-volt spa will require a special outlet -- and likely the services of an electrician to install the circuit. The location of the switch is also important: It should be visible from the spa, but at least 5 feet away so that it's not splashed. Ventilation. Hot tubs create a great deal of heat and moisture. If you plan to install one indoors, the room must be vented to prevent the growth of mold and mildew, and to keep walls and floorboards from rotting. Ask a contractor whether the ventilation in your room is adequate. A floor drain is also a good idea, since water is bound to splash or spill out of the spa, and even a small leak can leave a great deal of water on the floor. Safety. Like pools, spas can pose a drowning danger for children. A determined child can work even a heavy cover off a hot tub. Be sure that young children are never left unattended in a yard with a spa; for an extra layer of protection, invest in a locking cover. Once your hot tub is installed, it requires regular care to keep it clean and running smoothly. Spas should be covered when not in use for safety reasons and to conserve heat and reduce evaporation. A skimmer is handy for scooping out stray debris, and you should brush the sides and bottom of the tub weekly to clear away dirt and prevent algae growth. About once every three months, drain the water from the hot tub and clean its entire surface. A 600-gallon hot tub with just five people in it will accumulate body oils from dirt at the same rate as a standard swimming pool with 250 people in it. The filter is the first line of defense in keeping the water clean and most will last one to two years, but they must be cleaned on a regular schedule. The instructions included with your hot tub should explain how to do this. The filter can't do the job on its own, however; just as with a swimming pool, you'll also need to use a chemical treatment to kill bacteria and keep the water at the proper pH level (between 7.4 and 7.6). If the pH is too high or too low, it can irritate your skin and eyes or damage the tub's plumbing. You must also monitor the level of calcium in the water, which can leave scaly deposits on the equipment. Experts recommend testing your spa water at least once a week. The simplest method is to use a test strip that will show results within seconds. Chlorine is still the most popular chemical treatment for hot tubs, but some sanitizing systems use other chemicals such as bromine or natural minerals and enzymes. One newer form of water treatment is a saltwater system, which uses salt and a diamond electrode to create a chemical reaction in the water that helps cleanse it. Many newer hot tubs include an ozone generator or "ozonator" that produces ozone in the water. This won't eliminate the need for chemical treatment, but it can greatly reduce the amount of chemicals required. However, as discussed in our report on Air Purifiers, ozone is a dangerous gas and its use is controversial -- and probably to be avoided if your hot tub is in an enclosed space. Not many expert sources compare brands of hot tubs, and only retail sellers, like Home Depot, Amazon and Wayfair, allow customers to evaluate specific models. That makes Spasearch, which publishes an annual list of Trade Certified Manufacturers, an invaluable resource. Buying guides from the Better Business Bureau and Better Homes and Gardens were also helpful in compiling this report.